Serrapeptase dissolves non-living tissue including arterial plaque - and as a result it is believed to be helpful for the treatment of atherosclerosis. It may also help to maintain supple joints. 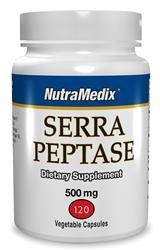 Serrapeptase is a proteolytic enzyme derived from the micro-organism Serratia E15. It was originally discovered in the intestine of the silkworm - friendly bacteria living in the gut of the silkworm produce this enzyme which is in turn is used to dissolve a hole in the silkworm’s cocoon. Serrapeptase does not harm any living cells or tissues in the human body - it only dissolves non-living tissue including arterial plaque - and as a result it is believed to be helpful for the treatment of atherosclerosis. It may also help to maintain supple joints. Inulin (Chicory Extract) powder 300mg, Serrapeptase (Exclzyme) powder 200mg, Vegetable capsule (Hypromellose & water).